Form 8050-1's can be obtained from your local FAA Flight Standards District Office (FSDO). Fees required for aircraft registration may be paid by check or money order made payable to the Treasury of the United States. Evidence of ownership can be shown on a AC Form 8050-2, Aircraft Bill of Sale, or similarly worded document. If a conditional sales contract is the evidence of ownership, an additional $5 fee is required to record that document. The application Form 8050-1 includes instructions on how to fill the form out. Submit the white and green copies to the FAA Registry; keep the pink copy in your aircraft as evidence of application for registration until you receive your Certificate of Aircraft Registration. The pink copy is good for 90 days and is only legal in the United States. If you plan to operate the aircraft out of the United States, you need to contact the FAA Registry and obtain a fax temporary authority (fly-wire). You cannot use the pink copy of the application outside the U.S. The request should describe the aircraft by make, model, serial number, and registration number. If operation of the aircraft is necessary before receipt of the duplicate certificate, the FAA Registry may, if requested, send temporary authority by fax. Include in your request your full address, fax number, and a telephone number where you can be reached. A Certificate of Aircraft Registration should be in the aircraft before an Airworthiness Certificate can be issued. 1. The aircraft becomes registered under the laws of a foreign country;2. The registration of the aircraft is canceled at the written request of the holder of the certificate;3. The aircraft is totally destroyed or scrapped;4. The holder of the certificate loses his or her U.S. citizenship or status as an alien without becoming a U.S. citizen;5. The ownership of the aircraft is transferred; or6. Thirty days have elapsed since the death of the holder of the certificate. The U.S. registration and nationality marking should be removed from an aircraft before it is delivered to a purchaser who is not eligible to register it in the United States. The endorsed Certificate of Aircraft Registration should be forwarded to the FAA Registry. 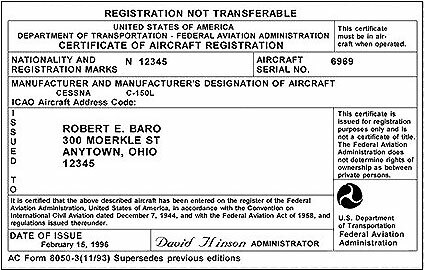 A dealer's aircraft registration certificate is another form of registration. It is valid only for flights within the United States by the manufacturer or a dealer for flight testing or demonstration for sale. It should be removed by the dealer when the aircraft is sold. The certificate of registration serves as conclusive evidence of nationality but is not a title and is not evidence of ownership in any proceeding in which ownership is at issue. A U.S. identification number or "N-number" of your choice may be reserved, if available. This number may not exceed five characters in addition to the prefix letter "N." All of the five characters may be numbers (N11111) or four numbers and one suffix letter (N1000A) or one to three numbers and or two suffix letters (N100AA) may be used. In your written request, list up to five numbers in order of preference in the event the first choice is not available; also include a $10 fee. If your request is approved, you are notified that the number has been reserved for 1 year. You are also informed that this reservation may be extended on a yearly basis for a $10 renewal fee. When you are ready to place the number on your aircraft, you should request permission by forwarding a complete description of the aircraft to the FAA Registry. Permission to place the special number on your aircraft is given on AC Form 8050-64, Assignment of Special Registration Numbers. When the number is placed on your aircraft, sign and return the original to the FAA Registry within 5 days. AC Form 8050-88, Identification Number Assignment and Registration of Amateur-Built Aircraft, is used by the FAA Registry to notify you of action taken on your application for registration of amateur built aircraft. The reverse side of AC Form 8050-88 is an Affidavit of Ownership for an amateur-built aircraft. Complete the reverse side of AC Form 8050-88 when applying for registration of an amateur-built aircraft. You may designate an aircraft serial number of your choice at this time. This becomes the official aircraft serial number. Submit AC Form 8050-88 along with AC Form 8050-1 to register your aircraft. If you have not reserved a special N number, the FAA Registry assigns a number at this time.